These are now the latest craze in the schools around here. 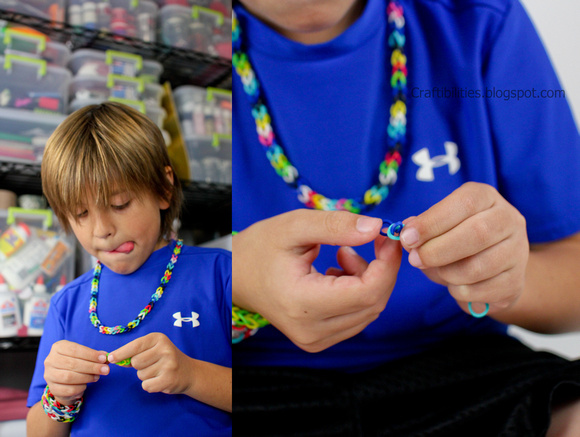 Latex free rubber band bracelets and necklaces. We are making the single pattern WITHOUT a loom!!! I think it's much easier and takes less time. If you are making more advanced patterns you will need the loom. Rubber bands with "C" clips!!!! 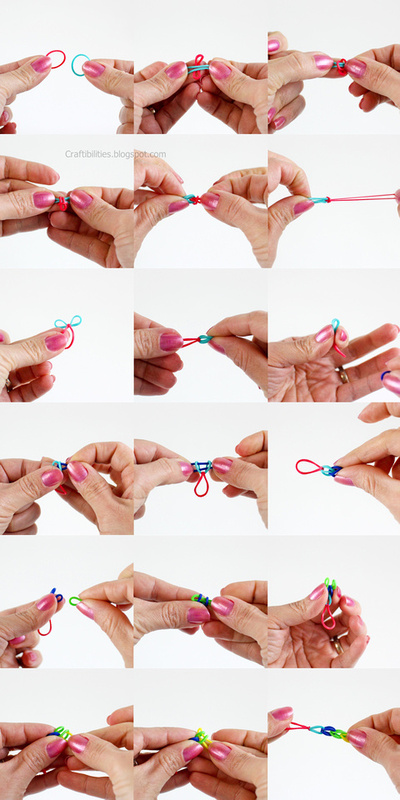 You can use a C clip that comes with the rubber bands or watch the video for an optional way to end the bracelets. The looms and rubber bands are sold out in most stores here and our Michael's Craft store didn't even know what they were. :( We purchased one from Amazon along with the rubber bands. In the craft room making MORE!!! Great idea making the movie tutorial. Tell the little guy in the blue shirt Grandma still has her bracelet and wears it everyday. I Love This Ruber Band Bractlers There Call And Plus Everyone At My School. Has Them including The Teachers Amazing Ah.!!! We bought the rubber bands, by themselves, at learning express. Thank you, Mary! I'm so glad to hear it was helpful. I'm also excited to hear you found some of the bands. We have a location close to us I'll definitely need to stop and check. Again, thank you for this tutorial! I shared this with my younger cousin who wanted to know how to make them and can't make mine because her fingers are too small. THANK YOU!!! Thanks for the link too. I really appreciate you taking the time to comment and checking out my blog. Where can i buy a bucket of c-clips without having to buy the rubber bands? I haven't seen the c-clips sold separately. Sorry. use jewelry-making c-rings! From any craft store! Thanks so much for showing us how to do this. 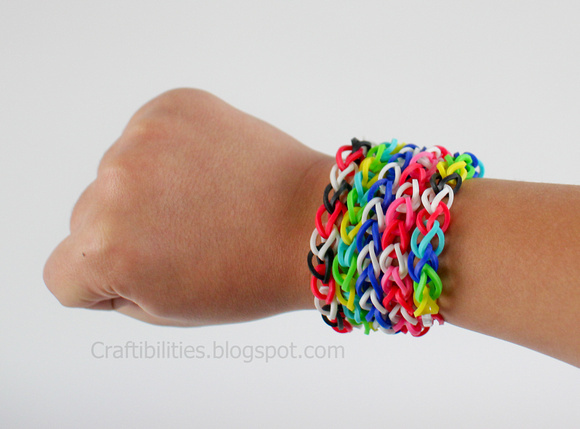 My daughter REALLY wanted to make some of these bracelets but I couldn't find the kit anywhere. You saved us money and made a bored 8 year old very happy! YAY!! So glad to hear that. Thank you for visiting my blog and taking the time to comment! hello!it was nice n interesting. That would be wonderful news. Do you happen to know whether it'll be all the stores or just the ones in larger cities? Thanks for sharing. We did finally purchase a loom for box bracelets and triples and we got it at Learning Express. I heard that JoAnns is going to start carrying the rubber bands so they might get the looms as well. Starting 3rd week in Aug. Info from another blog comment. I also want to know how they make the purses and wallets by just using rubberbands and C-clips. 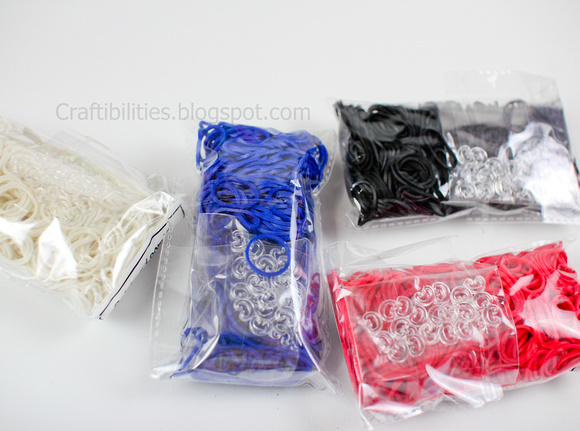 we found the rubber band refill kits at A.C. Moore and they had a display of how to make them with a french knitting loom which was 5.99 and with the 40% off coupon i had it was only 3.50. the kits were a pretty good price too 2.99 for 600 pieces with clips included. I have looked online and the refill packs are 2-3x the price. We found the rubber band refills at Five Below 3 for $5. Each refill has 300 in it. If you have problems feeding the bands through the loops, you can use a crochet hook. Just put the hook through the loops, hook on to the next band and draw through. Works well for those with larger hands, or if you have arthritis. These r so cool! But can u make them with regular rubber bands tho? I just got some today. They reminded me of finger knitting. It was easier for me to stretch two bands across two fingers. Take the ends of the bottom strand, pull them over my fingertips, so it doubled. Then repeat. If you do it right you can do two strands at once, using four fingers. Michaels craft store has started carrying the looms and the rubber bands. it is a huge item right now! Just thought id let ya know they have them cause I see a few posts saying they are hard to find. Wow, I love this! I just bought 6 packs, and I wanted to learn. I am really happy that you took the time to write this, and take explaining pictures. How DID you take those pictures while making the bands? Anyway, I will keep coming here for more ideas! Thanks! We live in southern Ontario and were able to purchase bags of 300 bands with the clips for .69 cents each at the Dollarama store. My daughter wanted them and I was not willing to pay the 18.99 Michaels wanted for a kit. We do no have a loom but she is happy making the single bracelet in lots of colour combinations. She made 5 this afternoon! 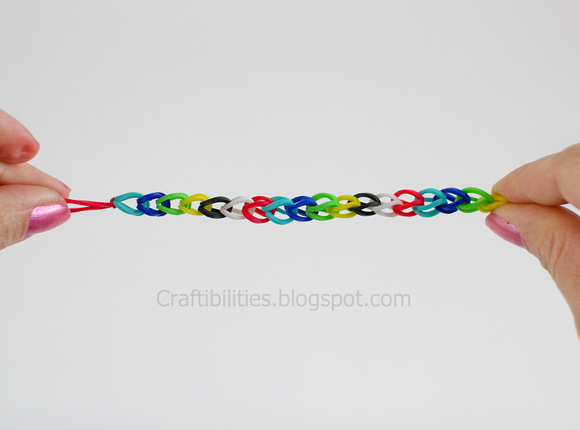 You can make fishtail and dragon scale without the loom, too! Thanks a bunch for the tut. my son (8 yrs old) made it all by himself looking at ur tutorial and was super excited. we got 100 rubberbands and 6 c clips from the dollar store. planning to check other stores locally for rubberbands. Can you please post other styles of bracelets? not sure if it is possible to do without the loom. I need a rainbow loom so bad. Our Wal Mart stores in KY have been selling the bands for $3.97 then had a clearance for 25 cents to get rid of them! Now they are not planning on getting any more. Hobby Lobby ordered more today. These are hard to find so I just ordered online from Amazon. Thanks for the tutorial! You can still buy them at Job Lot and on Amazon for $3, I did on Friday! Sorry Michal, haven't had a chance to email. Just send me email and will explain. I am thinking of purchasing a loom for a gift for my niece-would like to get online through Amazon or Walmart (or wherever) but am wondering what one to get-hoping to keep the cost down but am afraid if I don't get the most expensive one, it won't work...any advice? We purchased the Rainbow Loom brand and it cost around $20. I would suggest going with that brand just to be safe. I have been sooooo jealous of all the kids who have hundreds of loombands, I only have one given to me as a party favor!! I'm really happy to show them I'm equal to them now :-)! I made 10 loom bands 3 were fishtail,5 were inverted fishtail and 2 were starburst! I made them without the loom. So thanks for telling me u don't have to use the loom to make loom bands. 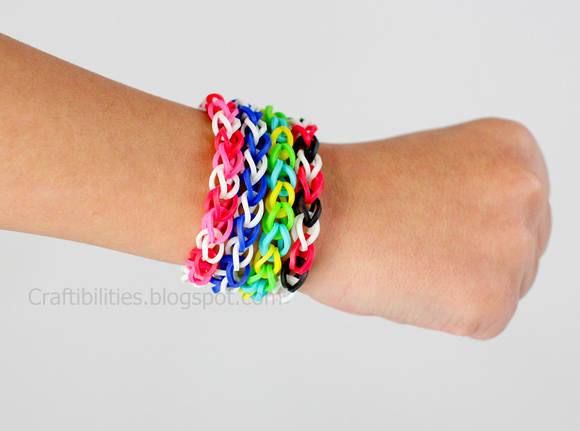 These latex free rubber band bracelets without loom is really wonderful. You can also make your own design with these bracelets. If you like making bracelets without the loom, check out Hooked on Rubber Band Jewelry by Elizabeth m. Kolmar. I teach my daughter to make rubber bracelets from Youtube, now she love to create and wear bracelets of different colors. Their color and elasticity feature attract her a lot, now spending most of their free time in making these bands..